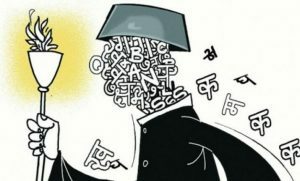 Hindi is the fourth most spoken language of the world, the mother tongue of around 258 million people, and the official language of India. Outside India, a considerable proportion of population use Hindi in more than 20 countries. World Hindi Day is celebrated under the auspices of the Ministry of External Affairs, Govt. of India, for the promotion of Hindi world-wide. Accordingly, Maulana Azad Centre for Indian Culture (MACIC), under the Embassy of India in Cairo will celebrate World Hindi Day at 4:00 pm on Wednesday 20th Feb. 2019. The winners will be awarded with prizes and certificates at a public function on 20/02/2019 at Gomhoria theatre. MACIC also conducts regular Hindi and Urdu courses and at present there are around 200 regular students enrolled at MACIC who pursue Hindi and Urdu courses at four different levels. As part of celebration, The prizes for the successful candidates in the regular Hindi and Urdu courses will also be distributed in the function at Gomhoria Theatre. The competitions except item no. 14 & 15 competitions will be exclusively for Egyptian nationals. Participants can read from papers or gadgets in song competitions. A jury will be appointed by MACIC for the evaluation of the performance under each item and the decision of the jury will be final. MACIC has all rights to make any changes in the time, venue or terms and conditions, and to cancel the competition fully or partially. The maximum number of participants in the group quiz is four members. The details of all team members should be furnished for registration. Level I & II students of MACIC will be considered as juniors. All others including former students and out-siders will be considered as seniors. In story expansion, the main ideas and key-words of a story will be provided. The candidates have to develop the same to a full story.